Why de-icing an aircraft is crucial? Why is it crucial for safety? On the ground, when there are freezing conditions and precipitation, de-icing an aircraft is crucial. Frozen contaminants cause critical control surfaces to be rough and uneven, disrupting smooth air flow and greatly degrading the ability of the wing to generate lift, and increasing drag. This situation can cause a crash. If large pieces of ice separate when the aircraft is in motion, they can be ingested in engines or hit propellers and cause catastrophic failure. Frozen contaminants can jam control surfaces, preventing them from moving properly. Because of this potentially severe consequence, de-icing is performed at airports where temperatures are likely to be around 0 °C (32 °F). De-icing fluids consisting of propylene glycol (PG) and additives are widely used by airlines for de-icing aircraft.Ethylene glycol (EG) fluids are still in use for aircraft de-icing in some parts of the world because it has a lower operational use temperature (LOUT) than PG. However, PG is more common because it is less toxic than ethylene glycol. 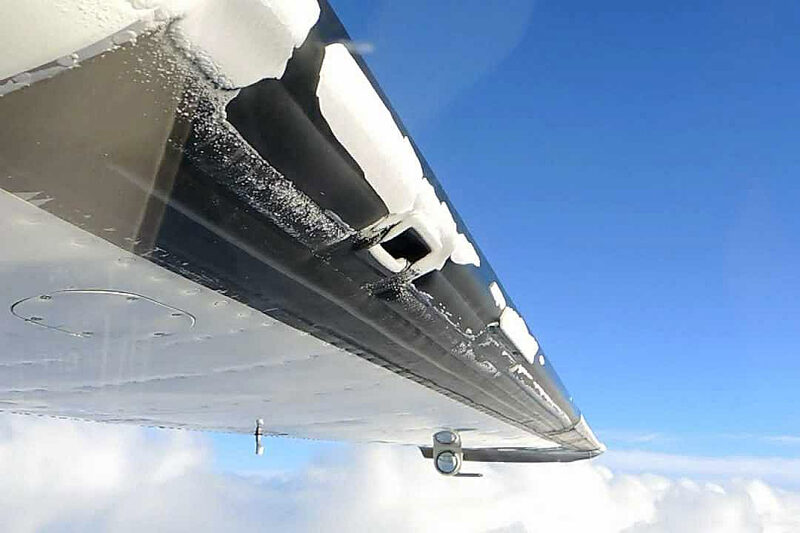 In-flight ice buildups are most frequent on the leading edges of the wings, tail and engines. Lower speed aircraft frequently use pneumatic de-icing boots on the leading edges of wings and tail for in-flight de-icing. The rubber coverings are periodically inflated, causing ice to crack and flake off. Some aircraft may also use electrically heated resistive elements embedded in a rubber sheet cemented to the leading edges of wings and tail surfaces, propeller leading edges, and helicopter rotor blade leading edges. Some aircraft use chemical de-icing systems which pump antifreeze such as alcohol or propylene glycol through small holes in the wing surfaces and at the roots of propeller blades, melting the ice, and making the surface inhospitable to ice formation. A fourth system, developed by NASA, detects ice on the surface by sensing a change in resonance frequency. Once an electronic control module has determined that ice has formed, a large current spike is pumped into the transducers to generate a sharp mechanical shock, cracking the ice layer and causing it to be peeled off by the slipstream. USAir Flight 405 was a regularly scheduled domestic passenger flight between LaGuardia Airport in and Cleveland. On March 22, 1992, a Fokker F28, registration N485US flying the route, crashed in Flushing Bay, shortly after liftoff from LaGuardia. The plane failed to gain lift, flying only several meters above the ground. The aircraft then veered off the runway and hit multiple obstructions before coming to rest in Flushing Bay, just beyond the end of the runway. Of the 51 people on board, 27 were killed in the accident, including the captain and one of the cabin crew members. A similar accident had happened three years before in 1989, when Air Ontario Flight 1363 crashed shortly after takeoff at Dryden Regional Airport after ice had accumulated on the wings and airframe. Out of 69 passengers and crew, 24 were killed. The subsequent investigation revealed that due to pilot error, inadequate deicing procedures at LaGuardia, and several lengthy delays, a large amount of ice had accumulated on the wings and airframe. Air France Flight 447 from Rio de Janeiro to Paris, France crashed on 1 June 2009. The Airbus A330, operated by Air France, stalled and did not recover, eventually crashing into the Atlantic Ocean killing all 228 passengers and crew on board the aircraft. The BEA's final report concluded that the aircraft crashed after temporary inconsistencies between the airspeed measurements, likely due to the aircraft's pitot tubes being obstructed by ice crystals. Unfortunately, this is just few cases of many, showing how crucial for safety de-icing is.